Measuring and ensuring the proper amount of refrigerant charged into a refrigerant bearing appliance during manufacturing. 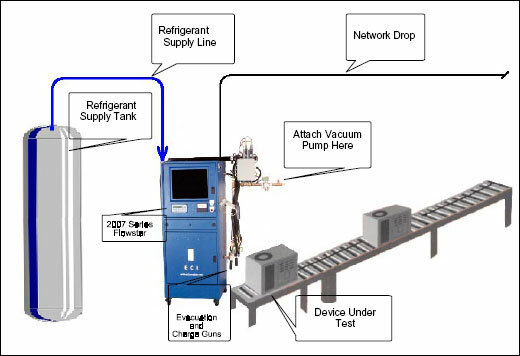 Customer requires a refrigerant charging system with a way to accurately measure the amount of refrigerant charged into a specific model during production. If their product does not contain the correct amount of refrigerant, it will not perform to specification, it will be less efficient, and its components will become stressed and damaged. ECI has integrated a Flowstar model 2007 (volumetric flowrate indicator/totalizer batch controller for refrigerants) with a computerized operator station through the use of the RS232 communications port. This creates a complete package that will charge a unit with specific amounts of refrigerant based on model dependent requirements. With the integrated flow system, we can charge a unit with an accuracy to +/- 0.1 ounce. The Hoffer flow system is economical, yet suitable for a high-capacity production environment. It provides mass flow calculation and corrects for temperature. The flow system has a high degree of accuracy and repeatability. The batch controller uses a prediction algorithm that increases the accuracy of the batch process. These features guarantee a precise charge and help to eliminate any refrigerant waste. As the unit moves down the assembly line, it will arrive at the ECI Single Point Evacuation and Charge Station. The operator will scan the serial number of the unit, which will load the test parameters for that specific model number. Once the unit has been hooked up to the evacuation and charge guns, the unit will be evacuated to a specific vacuum level, thus removing moisture. Once evacuated, the unit will be charged with a precise amount of refrigerant, which is measured and controlled by using a Hoffer Flowstar and flowmeter combination. The actual process data is then stored in a customer selectable database format. Thanks to the employees at ECI located in Collierville Tennessee for their technical assistance with this application.